The Hamami family is on a quest to construct a business group to survive for generations. The ultra-modern Trakindo building in Cilandak looks like one that should be in the central business district rather than a suburb of Jakarta. Yet its location is significant. It was here in Cilandak that the Hamami family’s business PT Tiara Marga Trakindo (TMT) has been located since 1971. That longevity, and respect for tradition, is a testament to the guiding philosophy of the family and its business interests. “My father always dreamed of having his business last for a 100 years. 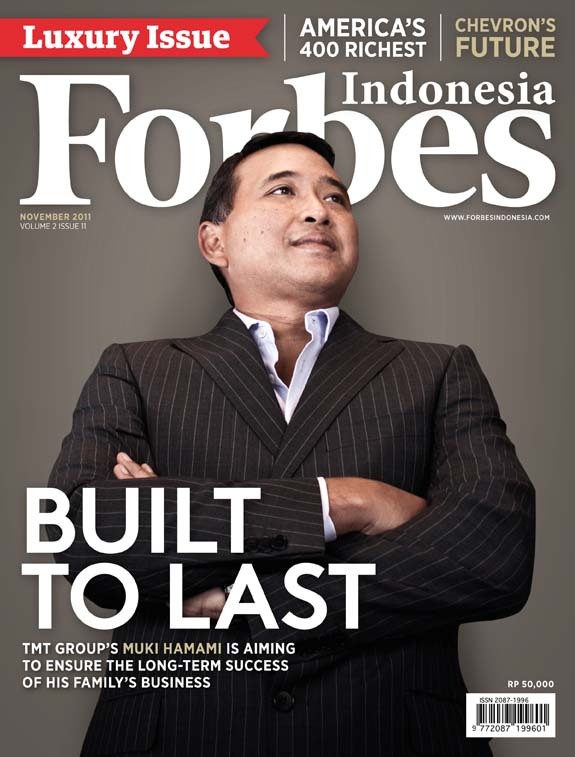 Anybody can have a family business but only a few can stand for generations,” says TMT President Director Rachmat Mulyana Hamami, known by his nickname“Muki.” “So I’ve been searching the globe to find how a family business can last for generations. We, myself and my brother Bari Hamami, have gone to seminars and courses worldwide and read books about family businesses.” To help make his point, he reels off names such as the Michelin family, whose relative still head the French tire company, or Japan’s Kikkoman soy sauce company, still headed by descendants of the original founders of 1603. In the case of the Hamamis, they decided that the core of their long-term survival should be a family constitution, a document that took four years to craft, having finished it in 2008. Just as constitutions guide governments, the family constitution is meant to guide the family business over the long term. The document came after many discussions, some of them blunt, amongst family members about the business, the founder’s vision, and various members’ hopes and roles in the family and the company, and the future of the philanthropic efforts that have always been part of the business. Such talks are hardly common in Indonesian families but Muki says they were necessary to get the buy-in from the entire family on the constitution. Professor John Ward, a family enterprise expert from the Kellogg School of Management in the U.S., helped facilitate the long drawn-out process. The constitution, which runs for six pages and is presented in plain language and not legalese. It is meant to be the framework that regulates almost everything within the family, its businesses and philanthropy including setting the times for regular meetings. Muki’s journey toward creating a built-to-last family business started long ago. At 47, he is the thirdof four siblings, three of whom are in the business while his sister Ana is a dentist. The group is divided into four parts, with the first and still core business being PT Trakindo Utama, the exclusive distributor in Indonesia for the U.S.-based Caterpillar heavy equipment maker. In the heavy equipment market, the leader is Japan’s Komatsu followed by Caterpillar. The two control about 75% of the total market by sales volume. The other three businesses under the TMT umbrella are PT Mahadana Dasha Utama (MahaDasha), PT ABM Investama and PT Chandra Sakti Utama Leasing. Muki currently wears two hats. The first is as the president director of what is called the TMT Group, the parent holding company. Second, he is also chairman of ABM. Muki says the total TMT group will book $3.2 bilion revenue this year, up from slightly above $ 2 billion in 2010, and is on track to hit $6 billion by 2015. With an EBITDA in excess of $500 million for 2011, the group enjoys 25% per annum growth, and has held zero debt for many years until 2009, when some leverage was added to ABM, he says. The family also contemplating to take ABM public in December [this month]. His father suddenly lost his sight to glaucoma attack in 1999 and has since been blind. It happened during a stressful period when he was shuttling back and forth to Singapore trying to restructure $118 million of company debt—a possible trigger for the glaucoma attack. Finding no banks willing to help, his father paid all the debts from their own sources and, until 2009, remained debt free. ABM is the holding company for energy-related businesses. The company’s initials are an abbreviation of the names of the family second generation: Ana, Bari, Muki, and Mivida, [but the formal name is Adiratna Bani Makmur. ABMM will be the company’s stock code in the Indonesia Stock Exchange]. ABM includes a number of sub-businesses such as coal production, contract mining, power solutions, engineering services and integrated logistics. It has installed capacity for temporary power close to 1,000 MW, and is in the process of adding a couple of IPP projects. “Its growth should be faster than Trakindo because it is in a really attractive sector,” says Muki. The decision to take ABM public is also part of the family constitution. Muki feels that if the group is public, it provides easily tradeable assets in case later generations would like to take the business in a new direction or leave it altogether. “With a market price, they can easily sell to their siblings or any family member, or the company could buy their stock,” he says. The other business, MahaDasha is meant to be a diversified play on the country’s development, with interests in property, IT and GDP related businesses. For example, the family has a long-standing policy to buy the land under the TMT Group, and since the Group has more than 150 branch offices, the company has built up a considerable land holding. But Muki is careful to stress the primacy of the Caterpillar business. After losing pole position to Komatsu, Muki is encouraged by Caterpillar’s new focus on Asia, with the company’s Group President Rich Lavin recently moving to Hong Kong to better engage with Asia. “Our bread and butter is heavy equipment,” says Muki. The elegant penthouse offices for Muki, his father and siblings provide a daily reminder of the roots of the TMT Group. The entire floor is decorated in full-length windows, and muted tones of white, light gray and polished wood. Scattered about are what appears to be a round batik pattern, done in bronze-colored metal. Yet a closer inspection shows it to be an interconnected combination of a rotor and a tractor’s wheel. “The design is to represent how we made our money and where the money is from. It’s from selling tractors and the color is to represent the copper and gold produced by Freeport and Newmont, two of our biggest clients,” says Muki. The unique motif can be found in the offices, the hallways and even the rest rooms. Aside from separate offices for each of the family executives, there is a large conference room. The two-storey high ceilings are more than dramatic; they also served a practical purpose of reducing the smell of cigarette and cigar smoke from the heavy smoker Muki and his father from bothering the other non-smokers as it is drawn up to the ceiling. Muki wants to ensure the ownership and leadership transfer between generations goes smoothly—a process he worries will be harder when the founder is no longer around. Therefore he feels now it is his and his siblings’ job to make sure the third generation, of which there are currently eight members, understand the concept of good stewardship as owners of a family business. Among other responsibilities, they should know how to analyze financial records, even if they lack a formal business degree. “The concept is you don’t need to work in the business to receive benefits from it. You don’t need to get involved but do need to be a good owner,” says Muki. The family constitution has guidelines for every member to be trained in the business for one or two years right after they finish their education. After the training period, the children should gain additional experience by working outside the company for five years. The constitution also allows for opportunities for members who wish to do philanthropy instead of business. Met Hamami is well known for his philanthropy programs, and the family’s various philanthropic efforts spend sizeable sum per year. The constitution also outlines how to set a budget for philanthropy budget with approval from the family council. Regular family meetings are also held, which can run several days with time for formal talks as well as relaxation and bonding. Met founded Trakindo in 1970 and first started selling Caterpillars in 1971. Met’s first career reached the sky, literally, as an elite jet pilot in the navy—an Indonesian “top gun,” which included training in the Royal Netherlands Air Force pilot program in Europe. Although he rose to become the youngest colonel in the Indonesian military, he took early retirement after souring on the endemic corruption in the ranks at the time. With little savings, he started a tutoring business, giving private math lessons to students at home. It was a tough time for the family. Muki and his siblings had to help out by selling. One of Met’s family friend and also at the time one of the country’s most powerful ministers, Sumitro Djojohadikoesoemo, heard about the situation. He offered Met a job as President Director at the Indo Consult, which oversaw foreign investments, pioneer of BKPM today. One of the companies that Met dealt with in his new job was Caterpillar. It was unhappy with its current dealer in Surabaya, who was doing little to promote the brand. Met saw an opportunity. Caterpillar was open to the idea of letting Met have the contract, given his military background and clean reputation. However, the company also wanted someone with some business experience. Then Met took evening classes in business at Krisna Dwipayana University, often studying until midnight, followed by additional training in the U.S. He clinched the dealership. “Caterpillar provided the equipment but the company was owned by my father,” recalls Muki. The timing was good. Construction and development was booming under the late President Suharto. In 1972, Met got his first real competition from tycoon William Soeryadjaya, whose Astra group became the dealer for Japan’s Komatsu, (a relationship that continues today). Yet there was plenty of business to go around. That same year, PT Freeport Indonesia, a unit of Freeport McMoRan, commenced its operations in Papua and became one of the Group’s biggest client. The logging industry and oil & gas also became a major source of business. Added demand came from Suharto’s policy of transmigration with new construction on islands outside of Java. Although Caterpillar enjoyed an 80% market share for a while, Komatsu continued to gain ground, especially in the mining sector. Today Komatsu has about half the market, and Caterpillar is number two with 25%. The remaining 25% is split between smaller competitors such as Hitachi (PT Hexindo Adiperkasa Tbk). Indonesia remains, however, one of the largest international markets for both Komatsu and Caterpillar. 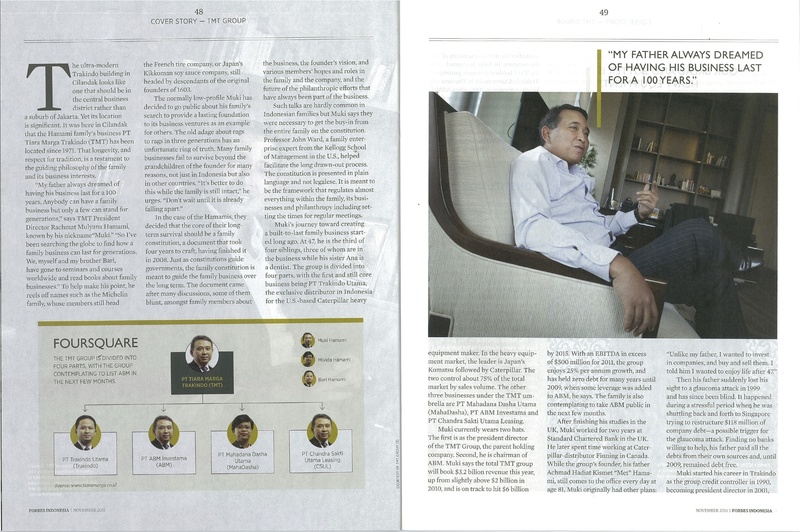 * This story appears as the cover story in the November 2011 issue of Forbes Indonesia magazine. 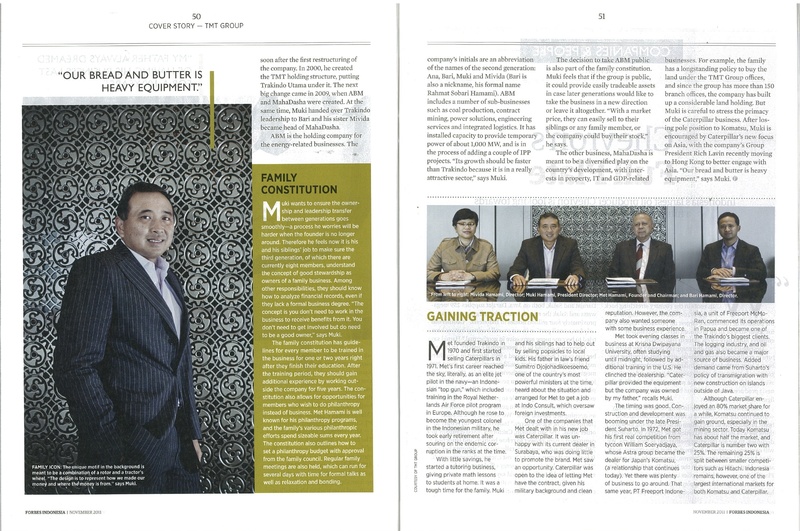 The same article has been published in Forbes Asia for the December issue, and also running in the Forbes US web site. The grey highlightt is additional info. See also Built to Last, other version of this story with more close & personal view and interview with Albert Jan Thomassen, member of the Family Business Consulting Group and an expert on family business governance, a colleague off Professor John L. Ward. This entry was posted in Companies, People, Publications and tagged ABM Investama, ABMM, Achmat Hadiat Kismet Hamami, AHK Hamami, Bari Hamami, Caterpillar, Chandra Sakti Utama Leasing, energy, Freeport Indonesia, heavy equipment, investment, Mahadana Dasha Utama, Mivida Hamami, Muki Hamami, PT Adiratna Bani Makmur, Rachmat Mulyana Hamami, Tiara Marga Trakindo, Trakindo Utama by Pudji Lestari. Bookmark the permalink. His father the founder sounds like an honest business man based on the story where he pay back his debt 800-ish million which is very hard to find in Indonesia. He remind me of my late father. Most business man will file bankruptcy. I do hope Muki can continue his father’s dream for his third generation to continue the business. It is not easy to unite your family. Thumbs up for you and the siblings. Thumbs up for your dad to raise you and other siblings the way you have become now.